Terse news, history and science. Despite cutbacks and financial stress in the industry, the mainstream daily news is still on the job, reporting on public corruption. Michigan issues manslaughter charges in Flint water crisis. Koch donors get tough with “Freedom” Caucus. 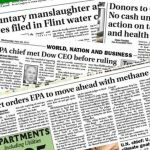 Dow Chemical pulls strings at EPA. Fed court tells EPA to enact methane drilling rule now! The Paragraph is a member of the reality-based community. See the discussion at Daily Kos and caucus99percent. Copyright (CC BY-ND) 2019 The Paragraph. Some Rights Reserved. The magazine-basic Theme by bavotasan.com.